Hello ... Hello ... my old friends ... It's great to see you once again! So we now have some of the detail regarding those new Jeff Lynne/ELO albums to be released in Autumn 2012. We know the artwork, we know the track listings and [more or less] we know the release dates! There appears to have been a mixed reaction from the ELO/Jeff Lynne fan base ranging from outright disappointment to the hopeful anticipation of what Jeff has been working on so diligently and for so long. The ELOBF view is this. There is no shortage of artistes who have either revisited their own back catalogue or recorded albums of their own interpretations of either 'classic' tracks or, indeed, their own favourites. The list includes long established music legends like Paul McCartney, Bryan Ferry, Rod Stewart, Glenn Frey and even the likes of Robbie Williams. Both Chris Rea and Def Leppard have re-recorded and updated their original masterpieces. So what Jeff is doing is not unusual but it certainly is a semi-surprise. 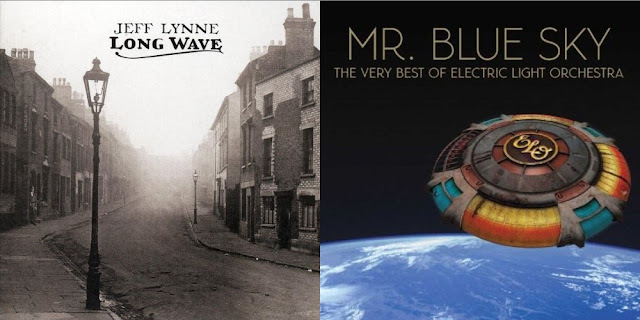 We should look forward to the twin release of "Long Wave" and "Mr. Blue Sky: The Very Best of Electric Light Orchestra" because it is so very long since we saw Jeff Lynne out there releasing. Twenty two  years is a long time but it should be noted that both Joe Walsh and Glenn Frey have recently successfully ended double decade recording famines too. We can look also forward to new ELO track "The Point Of No Return" [copyrighted in 2005 but 'new' nonetheless] on the MBS release and his cover of Roy Orbison's "Running Scared" on "Long Wave". Yours Truly KJS wouldn't be at all surprised if we see a bonus disc of "Zoom Tour Live" material and even a re-mastered, expanded "Armchair Theatre" within the next twelve  month time frame too. Watch that space! ELO Beatles Forever [ELOBF] supports, endorses and recommends the past, present and future work of Jeff Lynne and, of course, ELO. This includes getting behind these two new releases and catapulting Jeff and ELO back into the UK Top 10 album chart once again, hopefully for an extended period of time, up to and beyond Christmas. regarding jeff lynne and elo.